Ms vs. Miss, What Are the Differences? Difference Between Miss and Ms. If you are out and about and need to get someone’s attention, how do you address them? You can call a man by Mr. or Sir, and you can call a woman by Miss, Mrs. or Ms. Each one has a different meaning, so each one should be used individually. Therefore, knowing the difference between Miss and Ms. is necessary. In each of the titles used for women, they are all based on the women’s marital status. If she is a Miss that means she is unmarried; Mrs. indicates that she is married; and Ms. means that she can be married or unmarried. The word Ms. was popular one or two decades ago, but it actually originated in the middle of the 1900s; the title of Miss began in the 1600s. The main difference between Miss and Ms. when referring to a woman is that Miss indicates that the woman is not married, while Ms. has nothing to do with whether the woman is married or not. The title of Miss began in the 17th century and referred to any woman who was not married. It actually came from the word Mistress. While the use of Ms. had its origins long ago, it became more popular in the 20th century. The women’s movement worked hard to create equality for women and it was determined that Ms. was the best connotation for every woman. 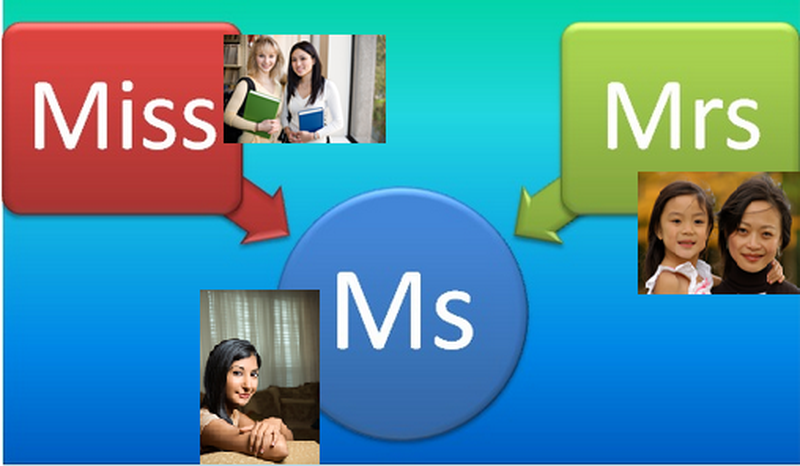 The term Ms. was used more in the 1970s than ever before. It has since dropped off as many women who used the term seemed to be more identified as a “women’s libber” rather than as married or single. It is rare that the term Ms. is used in today’s society, yet on some occasions such as addressing a proper invitation, it can be used if you are not sure if the women is married or not. In more recent years, the term Miss has taken on another meaning; when a woman enters into a beauty contest, she is referred to as Miss…followed by the state she is from. The winners of other types of beauty contest are referred to as Miss America or Miss Universe. If you are not sure whether a woman is married or single, you can still address her as Ms. This title would be fitting for a woman who is single, married, divorced, or widowed. The title of Miss is clearly for women who are not married. I do not even know how I finished up right here, however I believed this submit was great. I don't recognize who you might be but certainly you are going to a well-known blogger in case you are not already. Cheers! I love all kinds of shows about cooking, crafts, home and garden projects, and inspirational /motivational messages. Server responsed at: 04/18/2019 8:44 p.m.